Jenny is a successful doctor, loving wife and mother of three teens: twins Ed and Theo, and younger daughter Naomi. Everything seems just right until Naomi doesn't come home from her play practice one night. At that point, Jenny's life unravels as she struggles to understand what happened to her daughter and discovers that her perfect family was not so perfect after all. 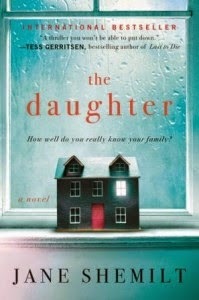 The Daughter: A Novel by Jane Shemilt is described as a psychological thriller but it's really more of an introspective story told by a mother who never really knew her family as well as she thought she did. It alternates between her recalling the days surrounding Naomi's disappearance and her life as it is a year later. Jenny is the voice of the story in both cases, so the reader is always within her, viewing the situation from her perspective. The premise of this story was interesting, the novel was too slow for my liking. While I wanted to know what happened to Naomi, I found myself skipping ahead to see what would happen because it seemed to just go on and on. Perhaps it was because I didn't feel a strong connection with Jenny; I think I got tired of her by about midway through the novel. She had such the perfect vision of her family, it was hard to believe that she really had no clue what was actually going on with her kids. The explanation of what happened to Naomi (don't worry, no spoilers) didn't seem highly realistic either, at least not in the very end. But I did like that it was a unique way to wrap up the story. The Daughter has gotten some good reviews, so it definitely appeals to some. I think I just expected more action or at least some more drama and excitement. This review was written based on a copy of The Daughter that I received from TLC Book Tours in exchange for an honest review.